Maui Kamaole is a lush, secluded oasis that is private and relaxing. Right across from the white sands of Kamaole Beach and Kihei boat ramp, this is the perfect place for your next vacation! This complex boats an uncrowded tropical pool with a waterfall and a sand bottom Jacuzzi. Also enjoy the brand new BBQ area and freshly paved tennis court. 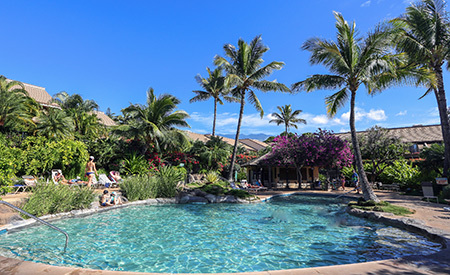 Maui Kamaole is located in the heart of South Kihei, just minutes from the white sand beach of Kamaole III, yet conveniently close to amazing bars, restaurants and activities.